Airport gyms, fitness centers, exercise clubs, workout clubs, gyms in airport, gyms near airports. Active travelers find fitness gyms or workout clubs or airports with gyms. Find a gym, exercise on the fly! This area of the airport gyms site is dedicated to Frequently Asked Questions (FAQs) we receive and miscellaneous articles and links we have found relative to the topics of airport fitness, airport gyms, gyms in airports, gyms near airports, and active traveling for fitness and active minded travelers. I am a traveler and found a gym or a gym owner and have a new club to submit for listing, what do I do? Please use our Contact Us form - we will get the new gym listed ASAP. 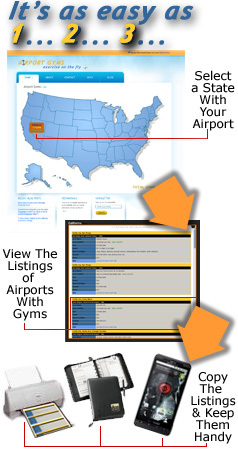 If providing a new airport gym listing, give as much detail as possible - similar to the listings you see now. Details such as exact gym name, contact data, hours, location, fees, facilities, etc. Can we advertise on the airport gyms website? YES! We are always open to offers for advertising (text links or banners) on a pay per placement basis. Please contact us for more details on direct ad placement within the site. Given that this site has been seen in some of the most visual nation wide magazine, and newspaper print articles, as well as heard talked about on radio and heavy linked to and written about on the web as seen by a quick Google search, you can be sure to gain a lot of exposure to your ads! You can even begin today if you are a Google user! How is this airport gym listing service kept FREE? First, by users supporting our sponsors and using the products and services advertised here. So please support or sponsors and their ads and links. Second, with donations from users. Please consider donating to the cause. We are not here to make money, we are here to offer this service, but we have just minimal costs to cover of course. If you find this service and site useful, please consider donating. Do you have a mapping feature on your gym listings? YES! We have added a basic Google mapping feature that allows you to see a local map of the area around the airport, and then even map directions to the gym. Just click the "CLICK to see a local map" link within the MAP section of your listing where you can zoom in/out, move it around, and even get a bigger map and get driving directions. NOTE: we notice at times the listings can lag in loading speed - this is due to the maps loading up for each listing. Can you help me find a personal training job, fitness job in the fitness industry or at a gym? No. We are not in any way associated with any gym or fitness center listed here. We do not run them, own them, have no contact with them, work for or work in them, etc. - we just list them. UPDATE: We see that several of our Google sponsored ads list companies that specialize in job openings at gyms. Watch for those ads! Where can we get a complete listing of airport gyms located IN airports across the country? At AirportGyms.com - obviously. Just start here. It would be great to have a separate list of just those gyms in airports instead of having to search within each state. As this is a free site, we might add that option when and if time permits. As for now, you need to search by airport in state as most users do not go looking for gyms in airports, but airports they are traveling through that have gyms in them. So having a list of only airports with gyms in them makes little sense. How do you get these airport gyms listings? We rely on user feedback to inform us of new listings or outdated/changed listings. If you have one to report, please contact us. Calling all pilots & frequent business travelers! Have you come across a gym that meets our criteria due to your extensive travels? Please let us know. Can you help us start an airport gym or do you know how to direct us to the resources needed to start a gym? Sorry, no. We are in no way associated with any gym or fitness center or workout club listed or the fitness industry other than to just list them. We do not run them, own them, have contact with them, work for or in them, etc. - we just list them. UPDATE: We see that several of our Google sponsored ads list companies that specialize in the service of starting a gym. Watch for those ads. Can you list our gym or a gym we found that is not in or near an International airport? What is the criteria? Sorry, but no. The point of the website is clear and just listing gyms in general defeats the purpose. Or criteria is to ONLY list gyms in an airport terminal at international airports or near (10-20 minute cab, shuttle or walk) from an international airport. Will you be listing gyms in other countries International airports besides the USA and Canada? Yes. We hope to in the future and we badly want to provide this service. We are slowly trying to build those listings, but they are very sparse since we rely on user feedback to get them. If you have International listings, please let us know. Your airport gym listing was wrong! Sorry. We naturally suggest that prior to just showing up, you call ahead and verify the current information you find here. We rely on user feedback to inform us of new listings or outdated/changed listings. If you have one to report, please contact us. And no, we are not responsible in any way for you lost time, cost, effort, etc. due to incorrect information. Use these gym listings at your own risk as an adult. Why are some airport gym listings so complete and some are so sparse? We rely on user feedback to inform us of all listings. We can only provide the information they provide to us. If you have one to report or more details to add, please contact us. How often do you update your gym listings? We rely on user feedback to inform us of all listings. We 'try' to update our listings at least 2x times a month - but this is subject to change. So, check back as new listings do come on line and old listings get updated from time to time as new information filters in from our users. Can we reprint these airport gym listings publicly elsewhere? No. Our policies expressly prohibit this reuse, reprint, publishing, dissemination, copying, screen shoting, cut-and-pasting of any of Airportgyms.com's™ original content, graphics, gym listings for any purpose, is strictly prohibited and not permitted. Should it be desired and requested, permission to use any Airportgyms.com™ content, is granted on a case-by-case basis. But these are proprietary listings provided directly to us by our users. Do you have a blog so we can keep up on the latest news? YES! Read our Exercise On The Fly blog and get the latest AirportGyms.com and travel related news & commentary. I know the state(s) & airport(s) I am passing through or have layovers at, but not where they are on your map. Sorry, we can't help you there. You might try Google, or maybe take a geography class at the local community college. Do you know the airport abbreviation codes? Why do the states with lots of listings load slower? First, we believe it is partially the load on the server, but more so, it is likely the Google Map embedded into each listing. So, when the page with the gyms loads, it has to load a map as well. For example, a page with 10 listings or so is loading 10 maps - it likely bogs the server down. But we are aware of it and are looking at methods to improve it. Why are there not more gyms in airports? Do you have a tool that can show me current flight delays? We sure do, click this link! Do you have a mobile site? Awesome site and a great idea! Thanks so much!~ A.G. Thank you for this fabulous site! I travel often for work and this will be incredibly handy. ~ L.B. I love your site! ~ K.Z. Finally! Can't tell you how many laps I've made around Stapleton & O'Hare all the while wishing there was a workout facility... ~ M.H. Thank you for providing this service, it is much needed! ~ C.H. You offer a great service to active travelers. ~ M.A. This is an incredible site! Most of us are athletic and our travel schedules kill our workouts. ~ P.K. I'am a very infrequent traveler, but appreciate this great resource. ~ S.S. I think this is a fabulous idea and must commend you on the idea. ~ A.S. This is a great resource for active business travelers - thanks! ~ D.D. I will be checking this site often on my travels, and telling others about it. ~ C.R. What a great site! I heard about it on CNN.com and wanted to praise you for your forward thinking. ~ T.R. Yes! I want to exercise on the fly and yes, I will use Airport Gyms. Thanks! ~ K.G. Sign-up for our newsletter. Keep up with the latest Airport Gyms listings & news.